Asilomar State Beach in Pacific Grove is a popular spot for nature walks, surfing, kayaking, kite flying, and romantic sunset strolls along the shore. Asilomar State Beach may only be a mile long, but it packs more beautiful views and natural diversity into that mile than most beaches have in ten or more. 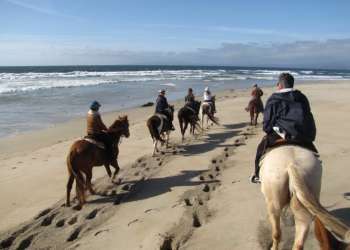 Asilomar State Beach is an accessible beach, and features beach wheelchairs to allow those with limited mobility to enjoy the coastal experience. It is also dog-friendly; dogs must remain leashed at all times. Visitors to Asilomar State Beach can also walk the quarter-mile boardwalk at Asilomar Natural Dune Preserve and learn more about the area&apos;s unique ecosystem. The boardwalk ends at the Asilomar Conference Grounds; originally designed by famed architect Julia Morgan in 1913, the conference center is listed as a National Historic Landmark and is now owned and operated by California State Parks. Make sure to explore the Asilomar Conference Grounds as you make your visit to Asilomar Beach. The main, mile-long trail at Asilomar State Beach has side paths that lead to tide pools. The curious will find a diverse range of sea life in these tide pools. Look, but don&apos;t touch; Asilomar State Beach is part of Asilomar Marine Reserve, and no fishing or collecting is allowed. Asilomar State Beach is a reliable and consistent surf spot where surfers can be seen nearly every day. Kayaks also dot the waters; marine life abounds at Asilomar State Beach and the kayaks let wildlife watchers get close to the action. If going into the water, be careful of riptides. Take Highway 1 to Route 68 west to Pacific Grove. Turn left on Sunset Drive. Follow Sunset Drive to Asilomar Avenue. Take Route 68 west. Follow it as it merges into Highway 1 south. Follow Route 68 again as it separates from Route 1 and continues west to Pacific Grove. Turn left on Sunset Drive. Follow Sunset Drive to Asilomar Avenue.